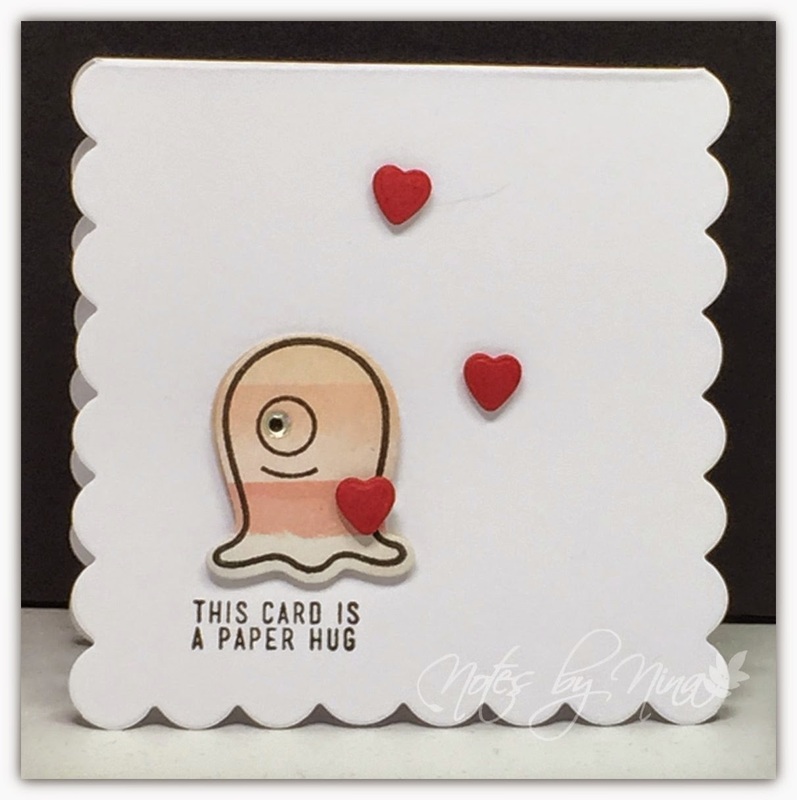 A very short post with a note card this morning, I love this quick and design. I used a papers from a Simple Stories paper pack, The sentiment is layered and popped up with foam tape, I finished with some twine. Supplies: White card stock, Designer Paper - Simple Stories, Simon Says Stamps - Sparkle & Shine twine. I have been crazy busy at work and it is only going to ramp up for the weekend after the opening ceremonies of our new building so I have not been feeling very crafty as of late. I managed to put together a couple of cute little note cards as thank you though. I used the fun little card bases I picked up from Michaels a few weeks back. Then I used some double-sided DP then added twine and a popped up sentiment. Supplies: White card stock, Designer Paper - Simple Stories, Simon Says Stamps- To Thine own Shelf, twine. Happy Tuesday, we have a new Tuesday Morning Sketches challenge for you today. Our sponsor is All Dressed Up. I could not resist using this cuter than cute image, as a result my center element is not quite oval. I used the Paper Boys papers and Little Treasure. To accommodate the bear I flipped the sketch and to place the button brads where as well as the paper button hear with twine. I coloured the image with my water colour pencils. Supplies: White and blue card stock, Designer Paper and image All Dressed Up, brads, button die cut. 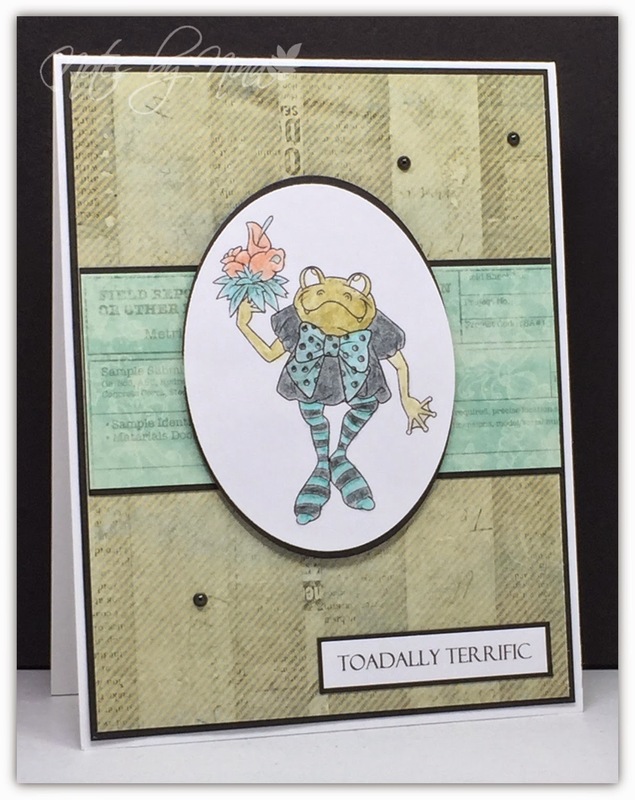 The design team has created some wonderful cards, stop by the Tuesday Morning Sketches blog to take a look. 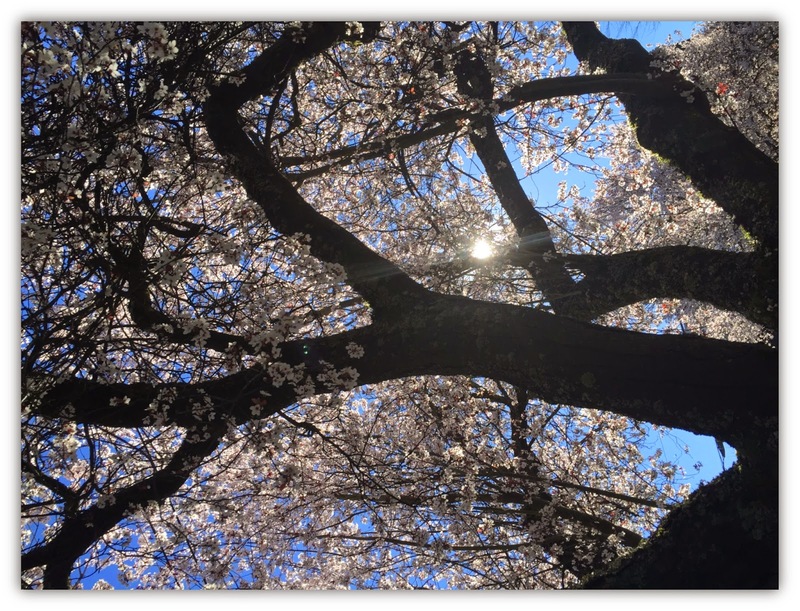 Another stunning weekend on Vancouver Island with beautiful weather, the cherry blossoms are so pretty and when there is a small gust of wind there is pink snow. 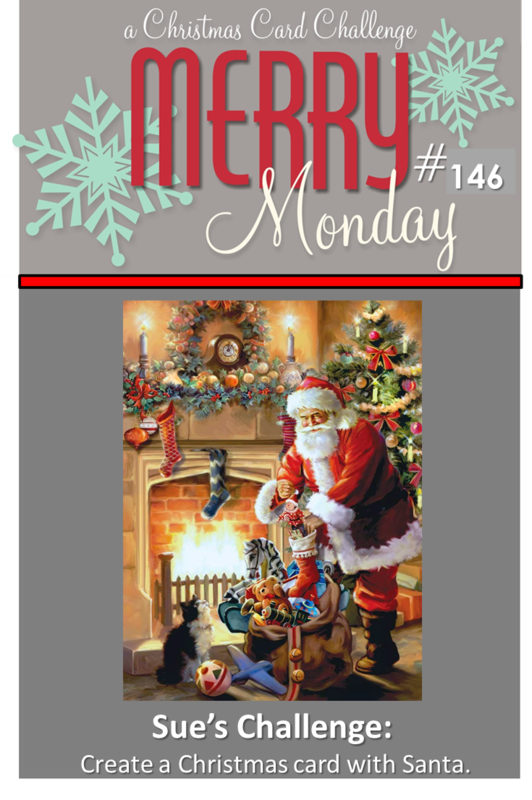 We have new challenge for you today over at Merry Monday Christmas Card Challenge. 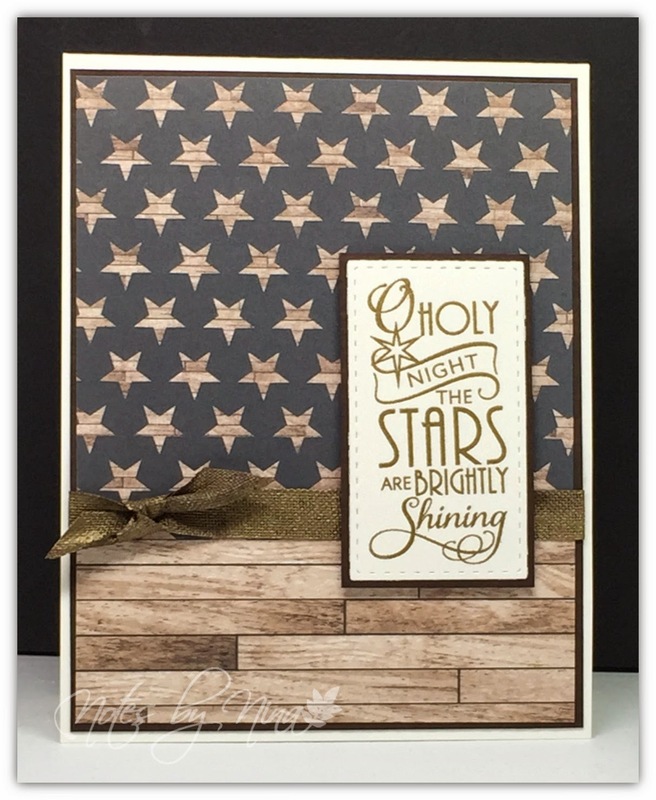 It’s Bonnie's Challenge this week - Create a Christmas card with star(s). My husband said my card was not very Christmas-y so I tried to add some shimmer by using gold embossing powder for the sentiment. I could not find a ribbon that would work so I used linen ribbon and added the same gold embossing powder to it, it made it a little stiff but it turned out ok.
Supplies: White and black card stock, Designer Paper-Carta Bella, Verve- Peace on Earth, ribbon. The Merry Monday Design team has some fabulous inspiration for you over on the challenge blog. Stop by, play along and don't forget to leave some comments. It was a pretty sunset last night too. It is actually challenge #13 :) I tossed out a family challenge to the usual suspects and got the go ahead to proceed and we welcome my niece Sam to the mayhem. I have to admit I was beyond tired when I put this card together, my eyes were blurry as I was gluing so don’t look to close at any measurements :). I love these MME papers, it is getting to be slim picken's for this little 6x6 paper pad. 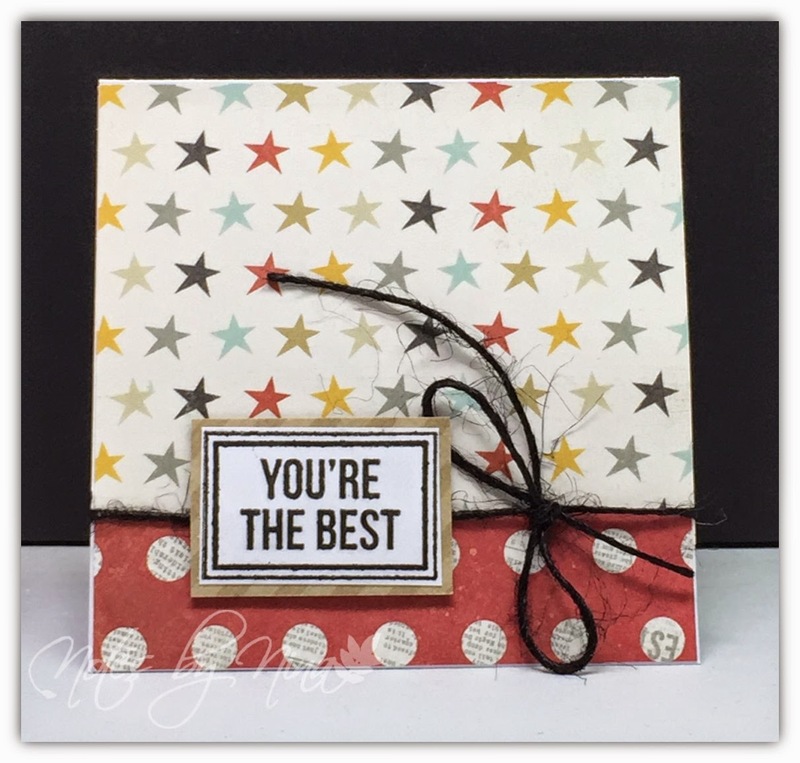 I stamped the sentiment with yellow then over stamped with black to blend with the papers, I used die cuts for the sentiment shapes and finished with some sheer ribbon. Stop by Barb's, Judy’s and Sam's blog to see what they have come up with for this challenge, be sure to leave some comment love. This challenge was inspired by this Stamp TV video. Supplies: White and black card stock, Designer Paper – My Mind’s Eye, Studio G-Hi, Inspired by Stamping-Fancy Label dies, ribbon. Happy Tuesday, we have a new Tuesday Morning Sketches challenge for you today. Our sponsor is Sweet n Sassy Stamps. I had some fun using Thankful Tommy Turtle Colored, I printed off the image multiple times in different sizes so I could use the little daisy. I used multiple layers for the circle and used foam tape on the sentiment and one of the daisies. I finished with some gems. 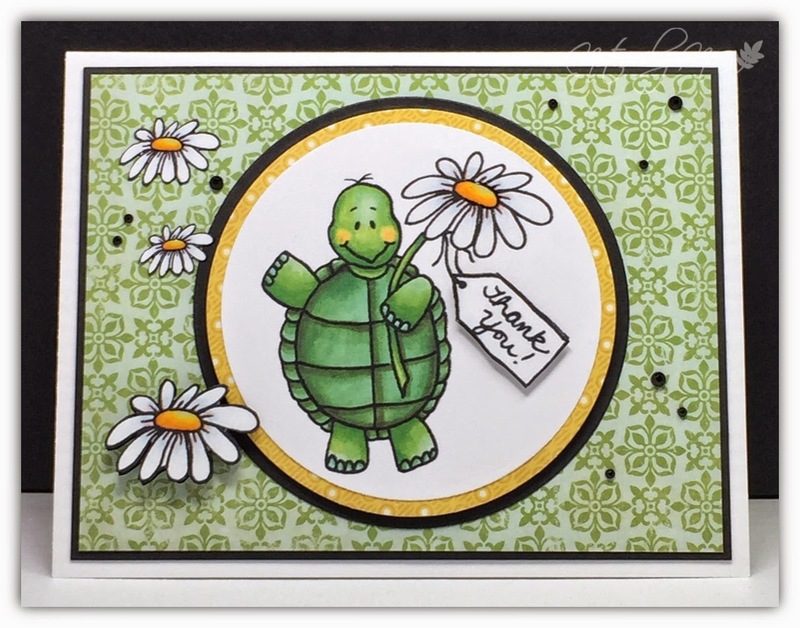 Supplies: White and black card stock, Designer Paper – Echo Park, Sweet N Sassy - Thankful Tommy Turtle Colored, circle die cuts gems. 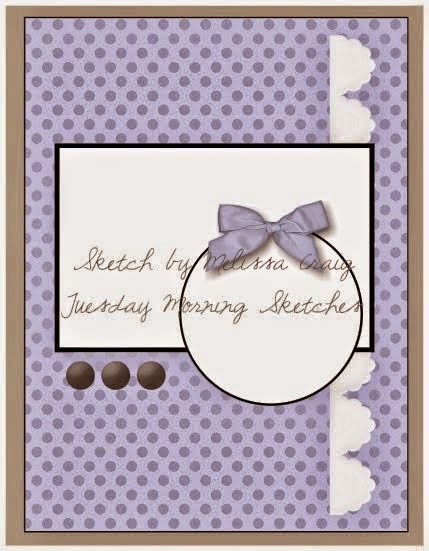 The design team has created some lovely samples, stop by the Tuesday Morning Sketches blog to take a look. Play along and lets see what you can create with this new sketch. 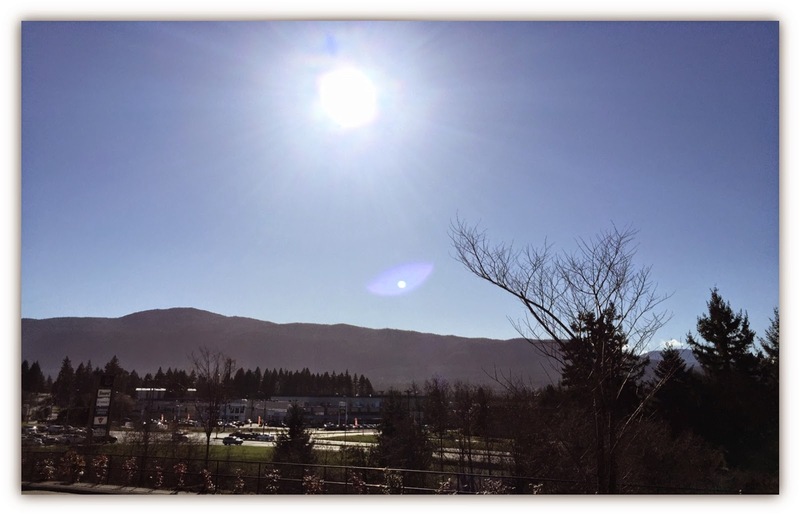 I wanted to share this stunning picture I saw from my window at work yesterday morning. Vancouver Island had a beautiful weekend weather wise, my mini daffodils are blooming and the cherry blossoms are stunning. My husband was mowing the lawn, I do love the smell of freshly cut grass. 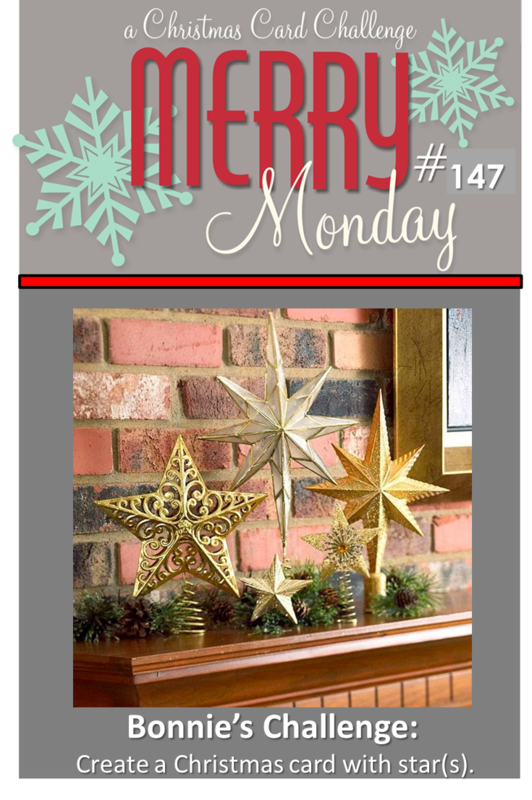 We have new challenge for you today over at Merry Monday Christmas Card Challenge. 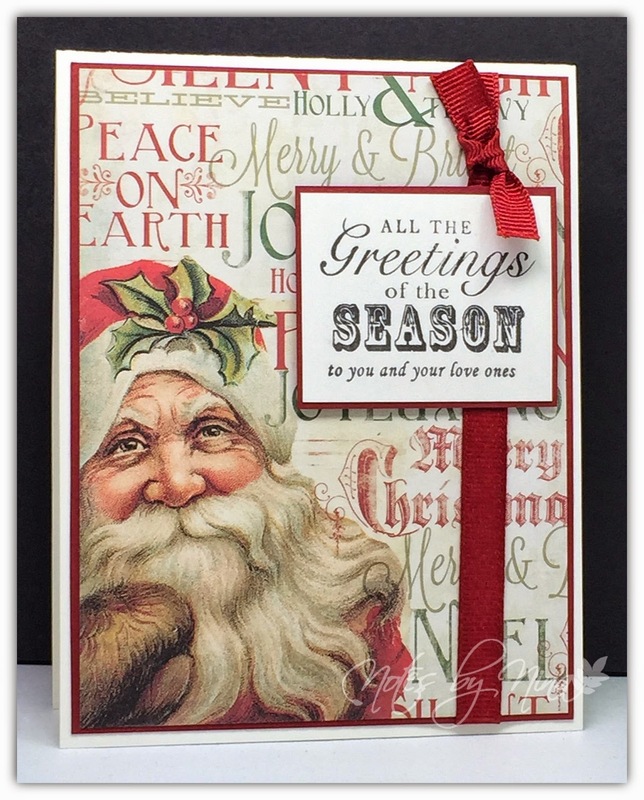 It’s Sue's Challenge this week - Create a Christmas card with Santa. I had the perfect piece of designer paper for Santa... of course :). I added a sentiment that is popped up with foam tape and added the ribbon to bring it all together. Supplies: White and red card stock, Designer Paper-My Mind's Eye, Woodware - sentiment, ribbon. The Merry Monday Design team has some great inspiration for you over on the challenge blog. Stop by, play along and don't forget to leave some comments. 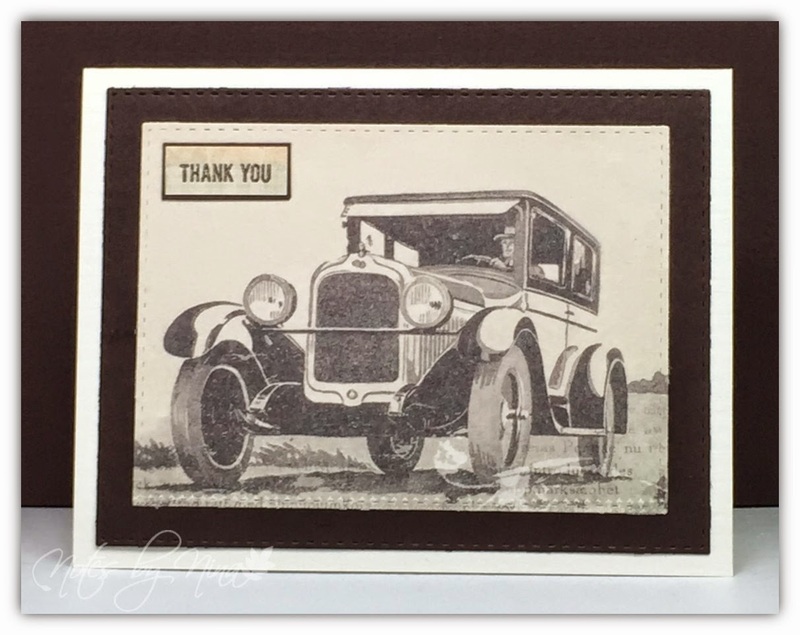 I quick second post for today, I needed a masculine thank you card and being as I am still playing with the papers by Pion designs that have vintage images on them that I think this vintage car worked perfectly. I used some stitched rectangle die cuts and layered them. I finished with the stamped sentiment. 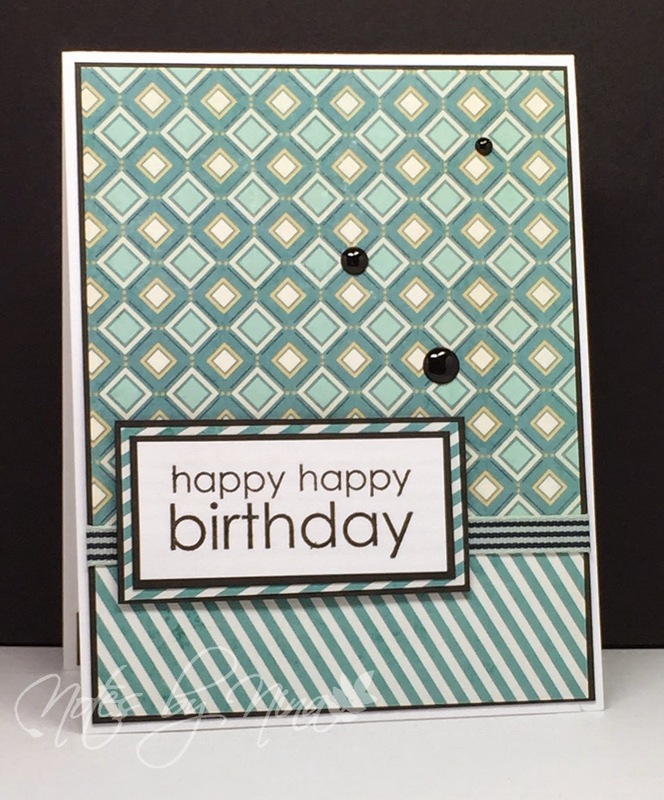 Supplies: Cream and brown cardstock, Designer Paper - Pion Designs, Sweet Stamp Shop - Thank you, Simon Says Stitched Rectangles. I found some of these fabulous papers by Pion designs that have vintage images on them that I think are beautiful, I can see me creating a few cards that showcase these images. 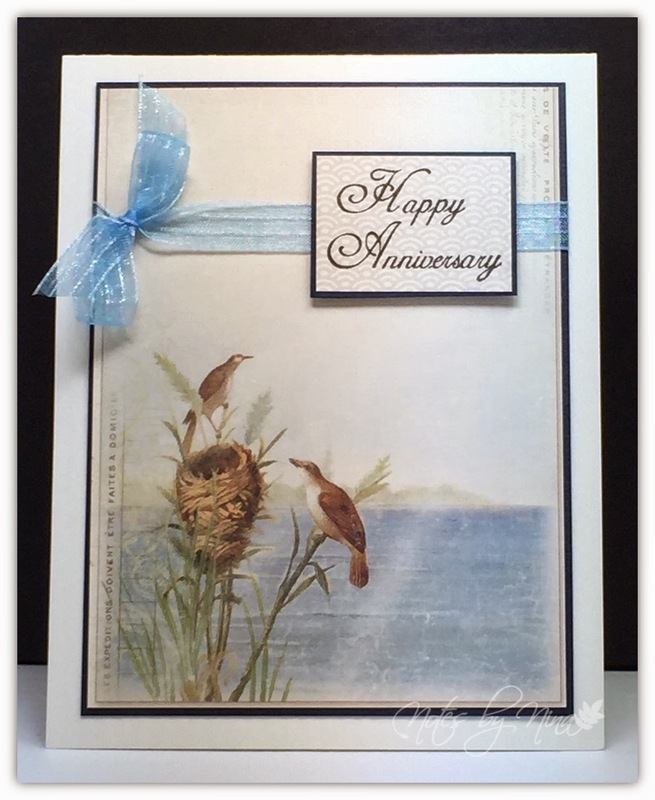 For this quick card I used a series of DP called Shoreline Treasures, I cut out a section that looked like a postcard. 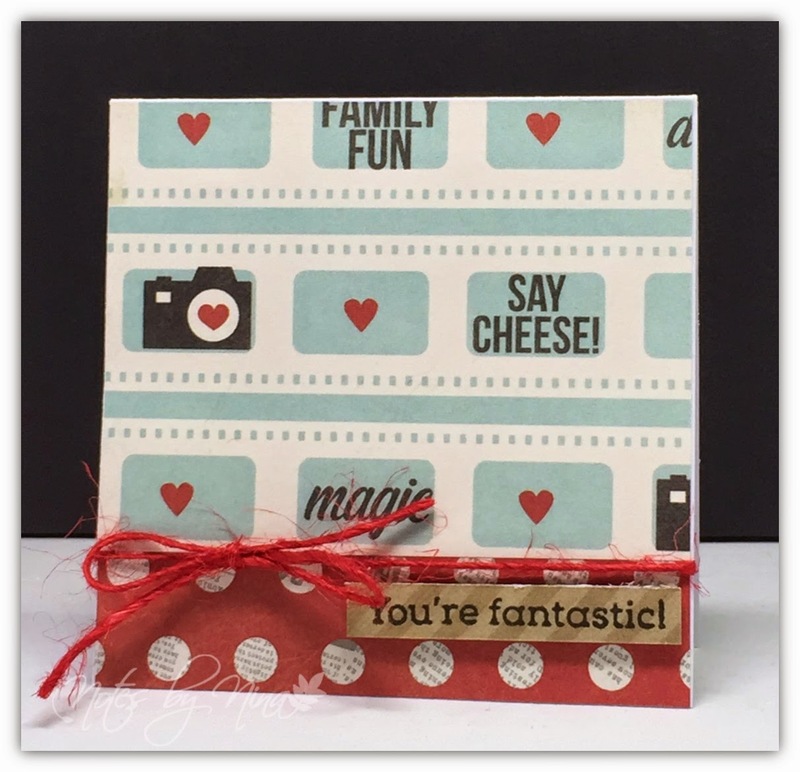 I stamped the sentiment and popped it up with foam tape and added some ribbon. Supplies: White and navy card stock, Designer Papers – Pion Designs, Inspired by Stamping – All Year Wishes, ribbon. 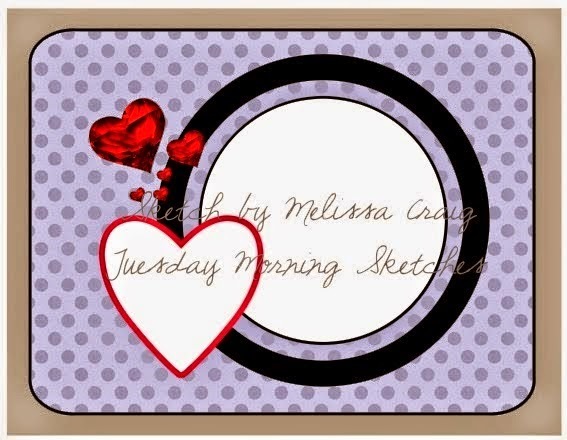 Happy Tuesday, we have a new Tuesday Morning Sketches challenge for you today. Today's sketch is one I have picked as one of my past favorite sketches, and our sponsor is Stitchy Bear Outlet. My circle is more of an oval to accommodate Flirty Frog, isn't he something. I used my water colour pencils to add some colour. I also added a little Wink of Stella to the flowers to give them a little sparkle. Supplies: White and black card stock, Designer Paper – Authentique, Stitchy Bear - Flirty Frog, MS Word - Sentiment, pearls. 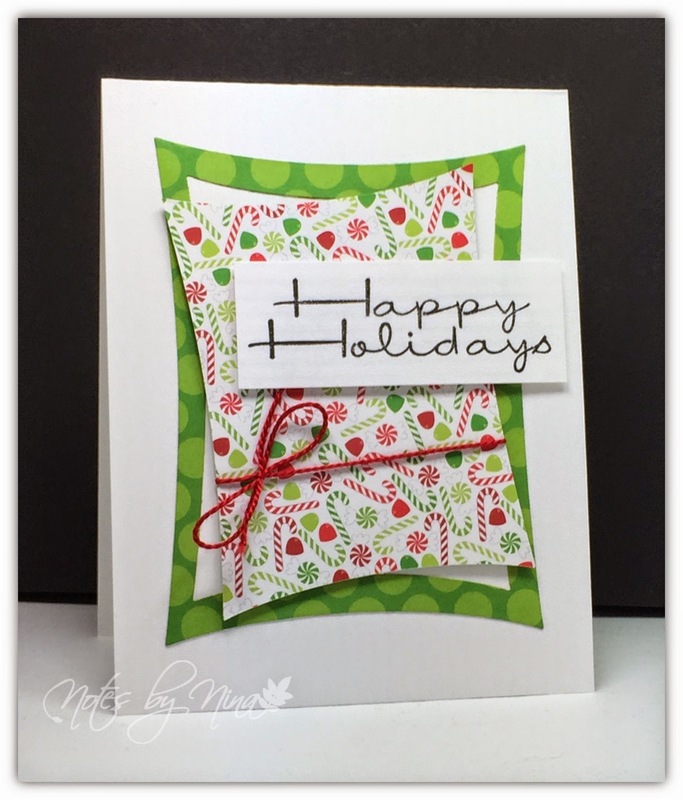 There is new challenge for you today over at Merry Monday Christmas Card Challenge. 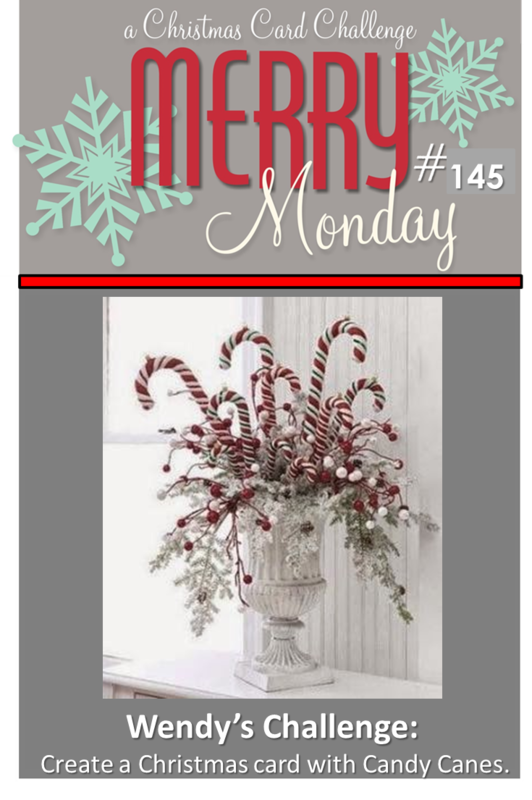 It’s Wendy's Challenge this week - Create a Christmas card with candy canes. I chose to use these bright fun papers, I used die cuts for the shapes and offset them and popping up the different layers with foam tape. I finished with some twine. Supplies: White card stock, Designer Paper-Doodle Bug, die cuts, twine. I found these cute little sets of cards and envelops at Michaels when I was there last week, I left them siting on my desk so they don't get tucked away like so many other supplies. I stamped and die cut this cute little monster a couple times then pooped it up with foam tape. I added a fish googly eye I found in the fly typing section of one of the many 'man' stores my husband like to visit. I also die cut the little hearts and popped them up with foam tape. The sentiment on the inside is Happy Valentine's Day. I will added this to the challenge over at The Friday Mashup. 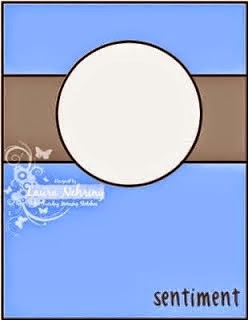 Supplies: White card stock, Designer Paper - My Mind's Eye, Lawn Fawn - , misc fish eye. 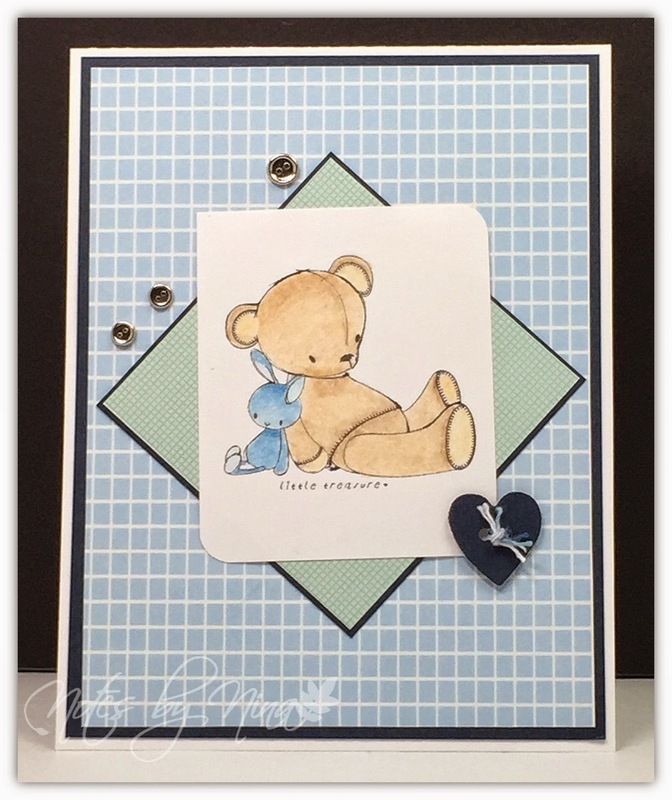 I had made two cards for this weeks Tuesday Morning Sketches Challenge, the first post earlier this week was the masculine version this is the girly one. I printed the image off and die cut it and added a thin border, I used a little bit of water colour pencil to add just a touch of colours then used my Wink of Stella to add sparkle. I stamped the sentiment right on the DP then finished with some pearls and ribbon. Supplies: White cardstock, Designer Paper - Teresa Collins, Sami Stamps -Butterfly Flower , ribbon, pearls. I have been so busy at work that by the time I get home there are no crafty thoughts flowing and my craft space has been neglected as of late. I did manage to get some time to play with my supplies this past weekend. I was not in the mood to play along with a challenge so I went with one of my go to layouts. I stamped the sentiment and layered it. The DP is from a 6x6 paper pad that I sized then cut to flip part over for the alternate pattern. I finished with some ribbon and dots. 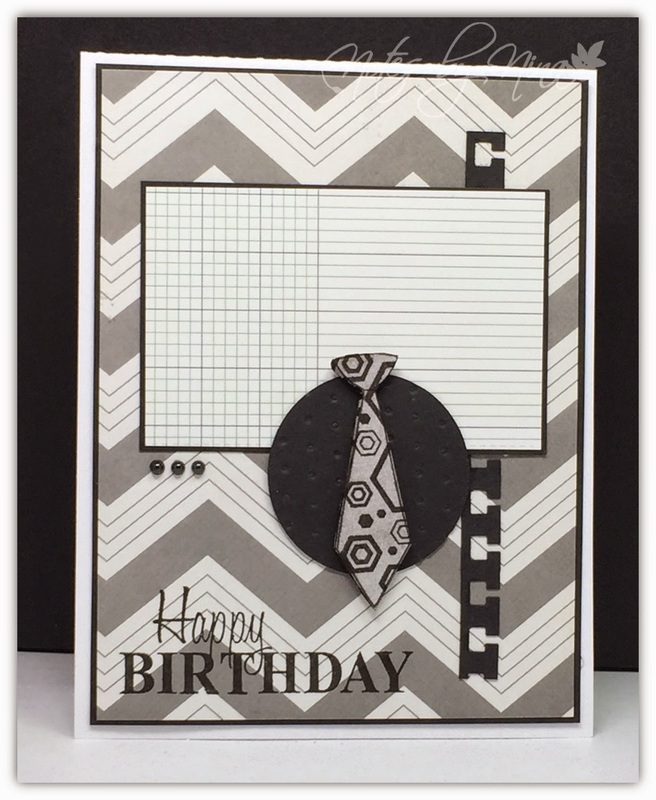 Supplies: White and black card stock, Designer Paper – My Mind’s Eye, Papertrey Ink-Birthday Bash, ribbon, dots. Good Morning and Happy Tuesday, we have a new Tuesday Morning Sketches challenge for you today. Melissa is picking one of her past favorite sketches this week, and our sponsor is Sami Stamps. I went with a masculine card for this challenge, I broke the seal on a new My Mind's Eye 6x6 paper pad. I printed off two plain ties and stamped a pattern on it then fussy cut it them out and doubled layered them with foam tape. I added some texture to the circle and finished by adding the sentiment and half pearls. 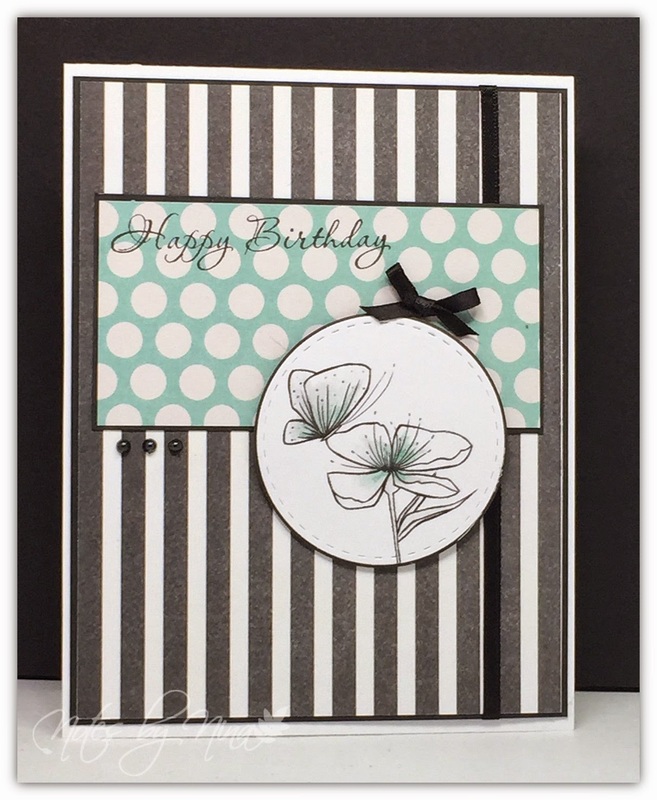 Supplies: White and black card stock, Designer Paper – My Mind's Eye, Sami Stamps - Plain Tie, Woodware-What a Catch, Fiskars - Hexagon Sentiments, misc punch, embossing folder, die cuts, pearls. Good Morning and welcome to a new Merry Monday Christmas Challenge. This week I am the hostess for this challenge so lets see what you can do with Bows, yes Create a Christmas card with a bow on it.. easy right. I chose to go with a simple but rustic double loop bow made of a fuzzy brown hemp. I think it goes well with my simple stamp that I have layered and popped up with foam tape. 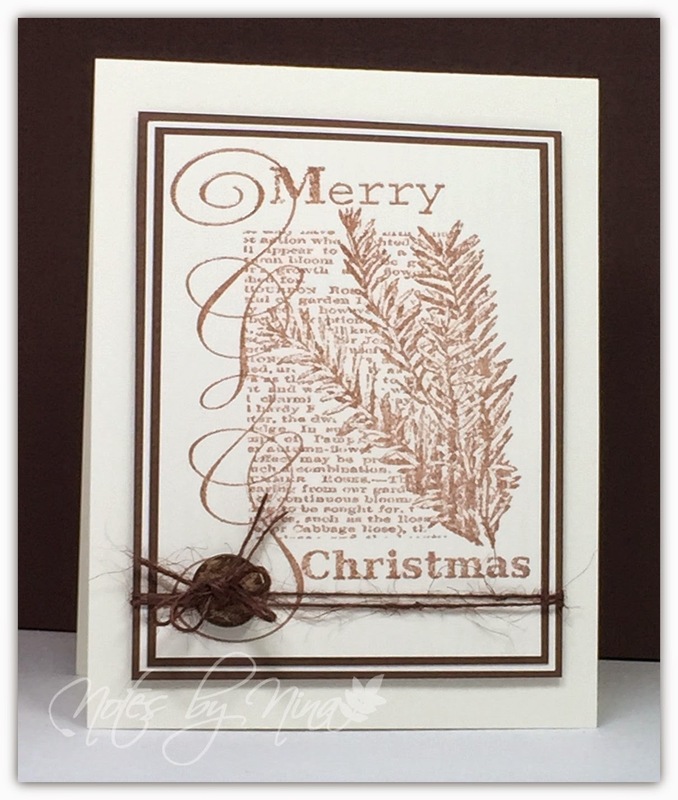 Supplies: Cream and brown card stock, Penny Black-Christmas Text, twine, button. 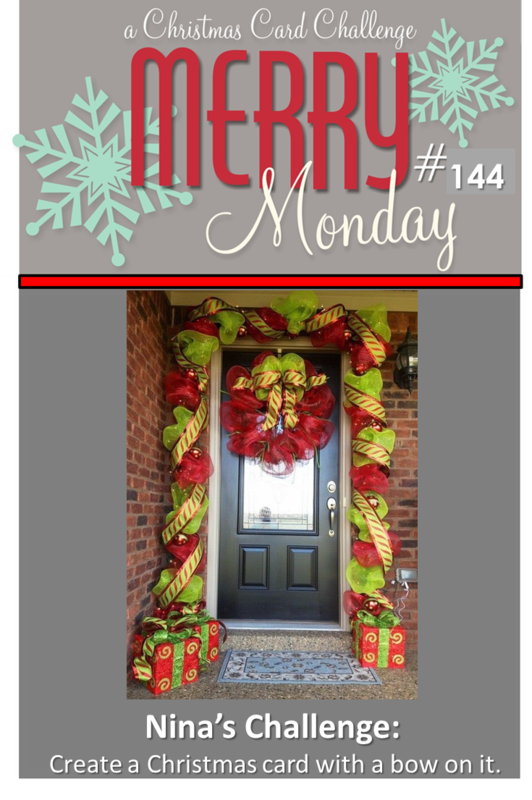 The Merry Monday Design Team of talented ladies had some great inspiration waiting for you over on the blog... Stop by, and play along.